I love a good Instant Pot recipe…especially when it is is full of veggies! Like Instant Pot Beef and Broccoli! This recipe is going to be a busy weeknight dinner game changer for you. Made with ease and speed, this dish is full of flavor and made with nothing but squeaky clean ingredients to fuel you on! Paleo, dairy-free, gluten free and even a Whole30 option. I am a no-fuss, no-muss kind of gal in the kitchen when it comes to dinner….or really any meal. I love to cook, but life is too short to spend oodles of time prepping food. There are books to read. Trails to hike. Dance parties to have with my daughter. And deep conversations to share with my husband. So if I can bank just a few extra minutes each day doing one of those things instead of cooking a crazy complicated meal for my family, you better believe I am going to do it. Which is one of the main reasons I am so glad I invested in my Instant Pot. It really does make meals that used to be complicated or time consuming so much easier. It allows you to make a beautifully nourishing home cooked meal for your family while still having time to enjoy your family. My IP has become my real food kitchen wingman…and I am cooking all the things in it these days it seems! 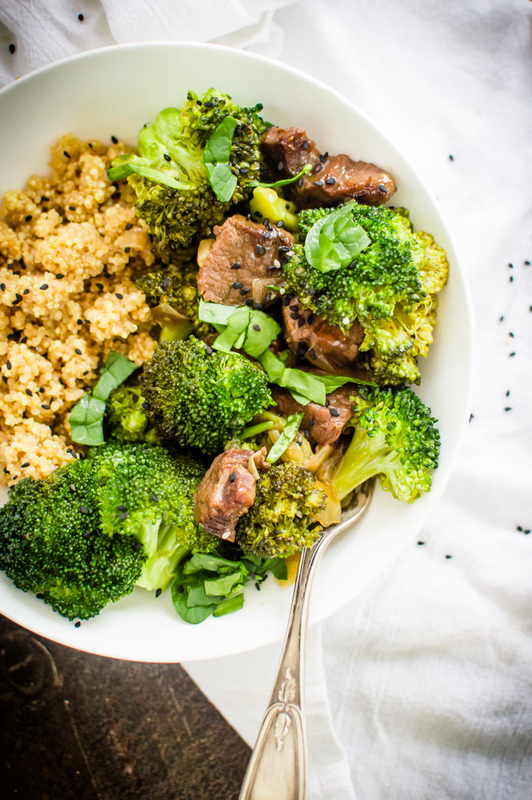 Like this Instant Pot Beef and Broccoli. I like that can be made easy peasy on a Tuesday night (notoriously our busiest day of the week) and I know I am serving up a dinner that is full of veggies, protein and flavor…without stressing myself out or even thinking about ordering takeout. Its a truly delicious real food comfort food that pairs wonderfully with rice, quinoa or riced cauliflower! Love veggie-loaded recipes as much as I do? Check out my ebook, Veggie-Loaded Love, for oodles of veggie-packed recipes...including Sloppy Joe Nests made with delicious flavors, spaghetti squash and oodles of flavor! It will change your dinner game! Turn your Instant Pot’s sauté function and add the oil to the pot. When the oil is hot, add the meat and season with the pepper. Brown meat for a minute or two. Add chopped onion and garlic to the pot. Sauté for 2 to 3 more minutes until onion starts to soften. Next, add broth, coconut amions, honey/maple syrup (if using), and sesame oil to the Instant Pot. Stir to combine. Place cover on your Instant Pot and lock it into place. Make sure the valve on the top is turned to sealing. Cook on manual HIGH pressure for 12 minutes. It will take your Instant Pot about 10 minutes to get up to pressure. When done cooking, carefully quick release the pressure. When all the pressure is released, remove the lid of the Instant Pot. In a cup or small bowl, combine arrowroot and water; mix until smooth. Add the mixture to Instant Pot and stir to combine everything. Next, add the broccoli to the pot. Stir. Again, turn your Instant Pot to the sauté function and let everything cook for about 5 minutes or until the broccoli is to your preferred tenderness and the sauce has thickened. Taste and add more pepper if desired. If sauce is too thick for your taste, add a little water or more broth to thin it out. Serve warm and enjoy it over rice, baked potatoes, rice cauliflower, quinoa or on its own. Garnish with sesame seeds if desired.